Born to meet the demands of an evolving insurance and rehabilitation industry, Talem Health Analytics is focused on raising the bar of medical treatment, improving data analytics within healthcare, promoting collaboration and growth for insurance companies. Researching both clinical and technology parameters is one of Talem’s core competencies, delivering evidence-based cost-effective solutions. The solution simplifies the medical management side of insurance claims, giving direction immediately once the claim has begun. Leveraging industry-leading machine learning and AI technology to create an efficient, cost-effective solution, Talem Health Analytics is committed to merging evidence-based research. 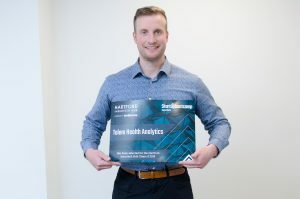 Based in Nova Scotia, Canada, Matt Kay is the co-founder and CO of Talem Health Analytics and has relocated to Hartford after being selected for the second cohort at Hartford InsurTech Hub. As we complete our sixth week of the accelerator program, we sat down with Matt Kay to ask him about Talem Health Analytics and how his journey has been thus far. Where did the idea for Talem Health Analytics develop from? Co-founder Paul Travis and I have been treating patients involved in a variety of musculoskeletal injuries for a combined 20 years. Motor vehicle and worker’s compensation injuries made up a significant portion of this population, which can become complex to treat. Trying to improve patient care we realized there was a gap in treatment as evidence-based care had not made it into the clinic and we weren’t using patient data to learn and improve. We feel this problem can influence claim duration, impact the time someone can return to work in a timely fashion, and lead to overall dissatisfaction with the process. Paul and I were very excited at the trend for technology to disrupt how we strategize treatment for these individuals. Talem Health was developed with the mission to provide evidence-based cost-effective care. Improving client outcomes and experience at a lower cost for the payer. How did you and co-founder, Paul Travis, meet? Paul and I have actually known each other for a long time, meeting in Scotland, where we both attended Glasgow Caledonian University to obtain our MSc Physiotherapy degrees. We soon became good friends during those two years. Following university, I ended up moving to Paul’s home town of Cape Breton where we both worked within the same company. Why did you choose the name ‘Talem’? When choosing a name, we wanted it to portray the ideals of our company, Talem was chosen for its close link of meaning empowerment and educate. We want to educate the population on what proper treatment for them looks like and we want to empower insurance and healthcare providers to make better patient-centered treatment decisions. Currently, we are positioning ourselves towards the motor vehicle insurance market as either a direct source of analytics to an insurance company or as an additional service a claims management company would offer. A key to our rehabilitation metrics is the crash severity score which is directly related to the amount of strain and specific tissues affected following a car accident. Joining an accelerator program had the potential to offer us numerous benefits that would be extremely difficult to obtain on our own. Talem grew to a point that we knew the market, audience and had an MVP and a pipeline of market pilots. However, access to the right level of decision makers within the insurance industry, investment, skills development, and support was difficult to access independently. Hartford Insurtech Hub is the type of accelerator that could provide everything we needed. NSBI (Nova Scotia Business Inc) sponsored Talem Health to attend the collision conference in New Orleans, during our day pitching we met Leland. After a fairly short discussion, he had provided us with enough information that Hartford Insurtech Hub was the perfect fit for us. Soon after we applied, and decided it was going to be the only accelerator that Talem applied for. Fortunately, Talem Health was accepted to the 2019 cohort.